Donna Karan never strays too far from the simple styles that made her famous. Her Spring 2007 DKNY runway looks consisted of mostly minmal pieces and muted tones – lots of grays and khakis. 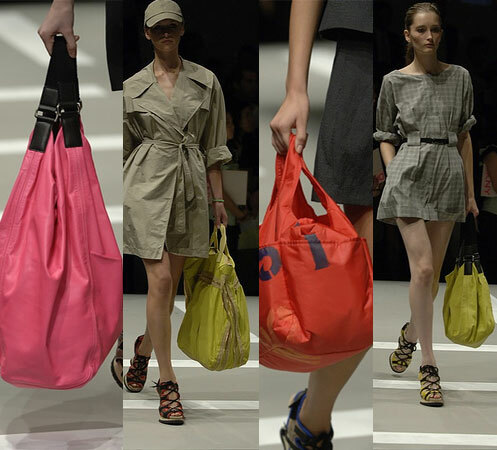 But one great thing about the show was the punch of color thrown in by the handbags which were carried on the runway. Oversized handbags, a trend for Fall, have apparently been carried over to Spring as well. One difference is shorter straps, so that the bags can be carried by hand, rather than over the shoulder. My favorites from DKNY are the bubblegum pink and mustard leather hobos with short black leather straps, a large orange nylon satchel embellished with stenciled block lettering, and another oversized mustard handheld tote. DKNY shows that simplicity is acceptable for an outfit, but that you can go wild with colored handbags to keep the look young and fresh.